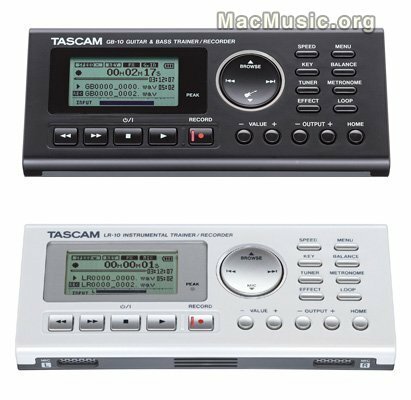 Tascam unveils the GB-10 Guitar/Bass Trainer/Recorder and LR-10 Instrumental Trainer/Recorder. The GB-10 Guitar/Bass Trainer slow down and loop MP3 files without changing their pitch to help musicians learn new songs and licks. The latest generation features CD-quality recording with overdub to build up an arrangement. The SD card slot includes a 2GB card, and the new tabletop design makes them the perfect tools for music students, hobbyists or professionals to perfect their instruments. The LR-10 is designed for strings, wind players, keyboardists, vocalists or any other musician. Use it to loop and transcribe your favorite music, record lessons or capture new song ideas. The LR-10 has a built-in microphone and speaker for recording and playback, and like the GB-10 includes a tuner and metronome.